Smoke & Mirrors is one of Bristol’s best pubs and lives up to its reputation by arranging shows and performances all the year round. The theme of the pub is magic and it also has a small theatre staging live magicians and so becomes a must place to visit for any tourist. The place has an array of performances and guest that come in to perform and hence does not see a dull day. There are charges if there is a performance going on which differ from show to show. Buses from The Centre (Co) can take you to the location. Avis Bristol Temple Meads is the nearest station Train Stationand trains can be taken to reach the destination. How popular is Smoke & Mirrors? People normally club together M Shed, Princes Wharf and Bristol Ferry Boat while planning their visit to Smoke & Mirrors. Fantastic boutique pub with a magical twist. If you like a beverage, close up magic and theatrical performances then this is right up your ally. Check it out! Absolutely bloody brilliant! Went on a Saturday night and the whole night blew me away. One of my close friends went to Smoke and Mirrors for her anniversary with her partner and said she enjoyed it. 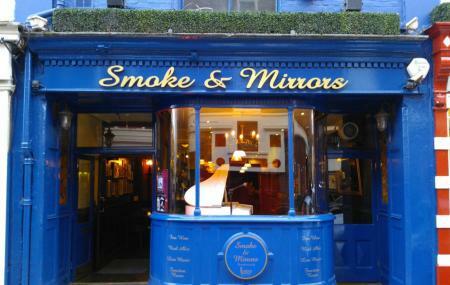 Taking her recommendation I looked into the place and saw how many good reviews Smoke and Mirrors had. Booking the tickets I honestly can say I had no idea what to expect as I had never been to a comedy or magic bar/show, let alone the two combined. The night was fantastic from the off. Richard Newman successfully warmed up the crowd with his cheeky but dry humour - right up my street as I love that style of joke. It really started the night off with a bang and you could feel the whole room getting into it. At the interval, my date and I had pizzas which were delicious and the bar staff were swift and efficient at serving us. Then came Mark Bennett's show and he cracked me right up. The atmosphere in the crowd was electric, you could tell people were buzzing off the back of RIchard's performance but Mark really knew how to work the audience. He had me in stitches several times and picking on my date was a highlight for me. The in house management team were fantastic, always making sure you were comfortable and enjoying the show. I really didn't know what to expect but was so surprised at how much I had enjoyed myself. I've started recommending it to all friends and family!